A Magnificent Matte Finish Meets Legendary Design in This Two-Coin Set! Each legal-tender one dollar 2017 Burnished Silver Eagle in this two-coin set features the classic combination of Adolph A. Weinman's Walking Liberty and John Mercanti's heraldic eagle -- a stunning pairing that BU and Proof Silver Eagles have featured for decades. However, the artisans at the West Point Mint add a special dimension to these time-tested standards. Each one ounce blank of 99.9% pure silver is specially burnished, giving each finished Silver Eagle a smooth matte finish. 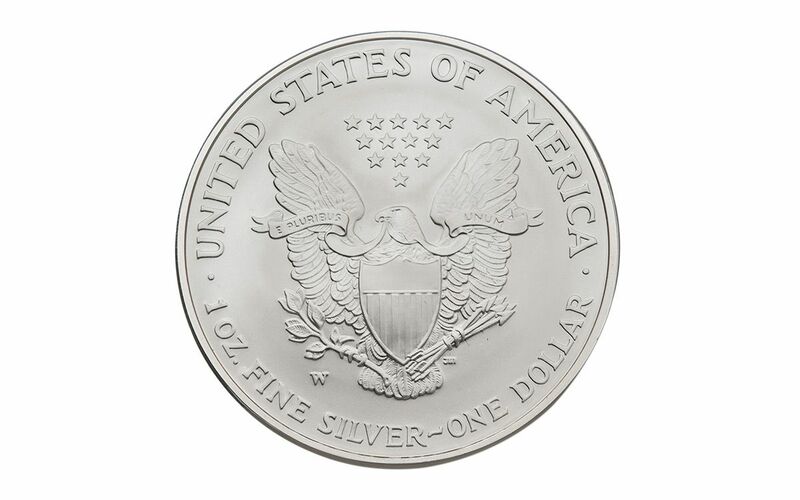 In addition, each coin is also struck with a special "W" mintmark, unlike the BU Silver Eagle. It all comes together in a spectacular set that your collection can't be without! Awesome Additions Make These Eagles Irresistible! Each coin will be certified Mint State-70 (MS70) by Numismatic Guaranty Corporation (NGC), a distinction that means your perfectly-graded Burnished Silver Eagles will have ZERO imperfections -- showing all features and fields exactly as the engraver and mint intended! 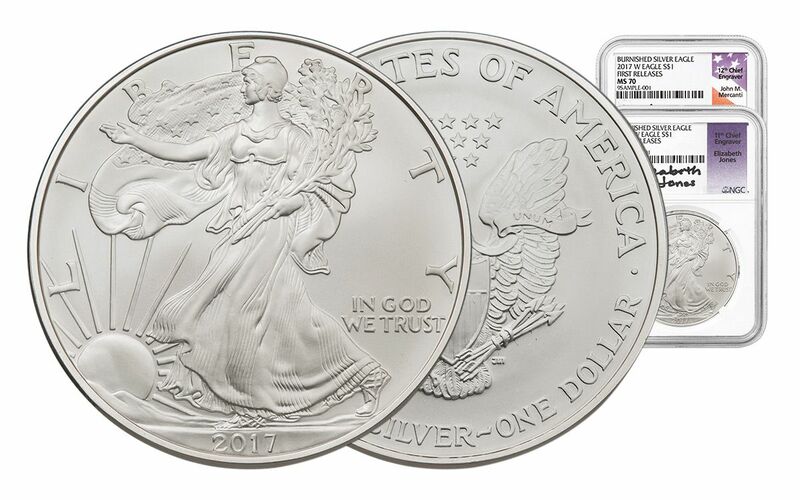 Each Burnished Silver Eagle will also be certified First Releases (FR) by NGC, meaning that they were among the first struck by the mint and were verified within the first 30 days of issue. Collectors seek out these coins because they are produced with new dies and considered to have sharper strikes and deeper mirrors than those that are struck later. Also, the population of coins labeled First Releases is only a fraction of the total mintage! In addition, your coins will be sonically sealed in individual acrylic cases with white display cores -- giving you the best in protection while granting clear sightlines into every beautiful detail. 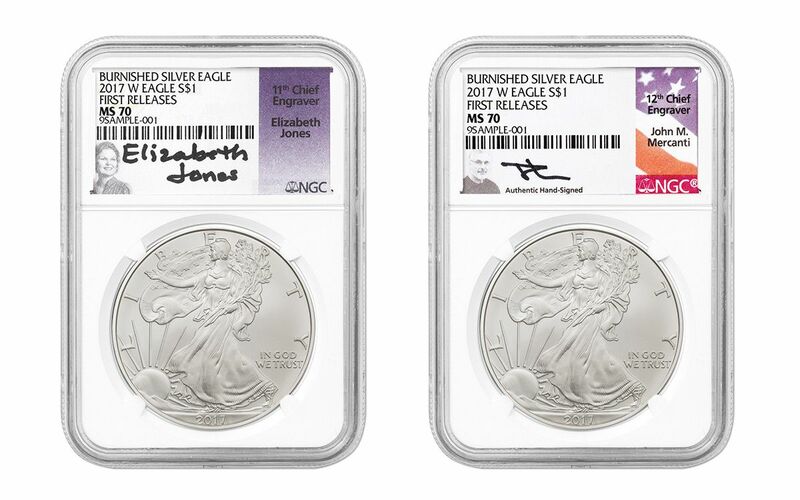 Finally, all of the unique characteristics of your Burnished Silver Eagles will be described in detail on the acrylic cases' labels, one of which will come hand-signed by Elizabeth Jones, the 11th Chief Engraver of the U.S. Mint. Appointed by President Ronald Reagan in 1981, Elizabeth oversaw the creation and launch of the Silver Eagle series in 1986! The other will come hand-signed by the designer of the Silver Eagle's reverse, 12th Chief Engraver of the U.S. Mint John Mercanti! While recent production numbers for BU Silver Eagles can be measured in tens of millions, average Burnished Silver Eagle mintages usually count in the low 100,000s. Combine those figures with the superb finish of these Silver Eagles and you can see why these coins don't take up residence in our vault for long. 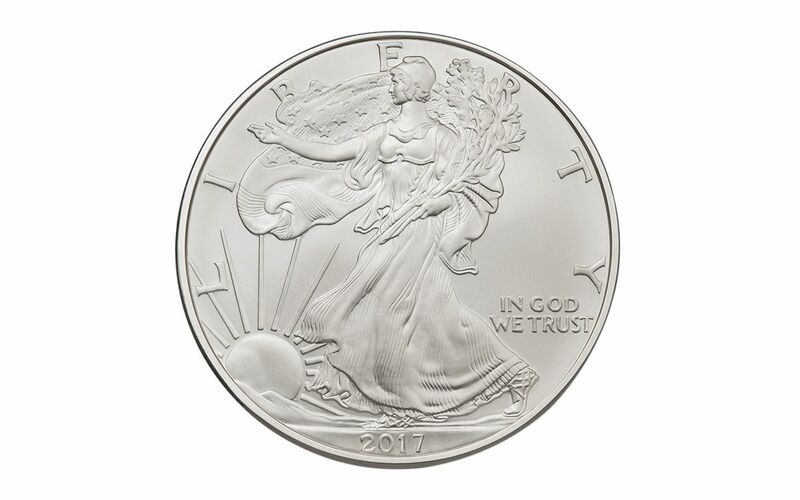 Don't wait -- make this 2017 Burnished Silver Eagle set yours today!